Consultation: Wes Finlay (left), Jessa Brie Berkner and Darren Bridgett worry about the famous Russian novelist expiring offstage. DESPITE ITS attention-grabbing title, Leo Tolstoy Is in the Next Room Dying is about much more than the final days of the Russian novelist. John Lowell's play, which the San Jose Stage Company is world-premiering to open its 15th season, offers a microcosmic view of life under the czar. Although Tolstoy is, in fact, in the next room dying, his unseen presence is the catalyst for, and not the focus of, the action in this touchingly funny drama. Lowell's script uses the basic facts of Tolstoy's death in 1910 to weave a fanciful tale about how his life and work affected his countrymen. The characters who gather at his deathbed in rural Astapovo, where the 82-year-old novelist fell victim to pneumonia after having fled his nearby estate, each reflect some aspect of the class system Tolstoy simultaneously embraced and abhorred. In Lowell's version of events, Tolstoy takes ill at the Astapovo railway depot, run by Marfa and Nicholai Oblensky (Janis Bergmann and Patrick Flick). The peasant couple's relationship is the source of much of the play's humor, as are their very different reactions to their unexpected famous guest. Bergmann's outrageously deadpan Marfa decides to exploit the situation and charge admission to Tolstoy's well-wishers, whereas her plainspoken husband would just as soon everything return to normal. They communicate their disagreement in that verbal shorthand used by many long-married folks, putting themselves on intimate terms with the audience from the play's opening moments. Director David Ogden Stiers gives greater weight to these quietly funny exchanges than to the show's more farcical scenes, thereby smoothly blending the comedy and the drama. Dr. Rostov (Wes Finlay) is the character who best embodies both facets of the play. He's introduced as a doddering old man whose memory lapses and fondness for applying leeches and enemas make him laughable, at least to those who aren't under his care. By play's end, Finlay has subtly morphed Rostov into the villain of the piece, someone who's far more concerned with the appearance of propriety than actually doing good for people. The doctor not only has no appreciation for the works of his patient, but bases many of his decisions regarding Tolstoy's health on the novelist's social status rather than on his physical condition. Rostov also has little regard for those who challenge his authority, particularly the journalist Miusov (Darren Bridgett) and Sophia (Jessa Brie Berkner), a local girl who keeps a daily vigil outside Tolstoy's door. As these two characters work to overcome the obstacles Rostov puts in their path, they reveal the hypocrisy of the doctor and of the regard in which he is held. 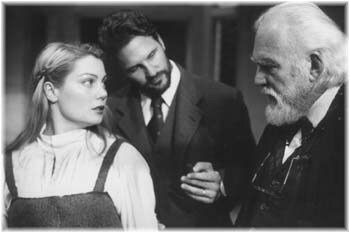 Tolstoy's station in life is the topic of much debate in the play, the main question being whether the man lived as he wrote. What is not in contention is that his novels both honored and moved his fellow Russians, and Lowell's play is a fitting memorial to a literary giant whose ideals profoundly impacted his nation, whether or not he lived up to them in the end. From the Oct. 23-29, 1997 issue of Metro.